Investigation was done By the paramormal society GRIP of India. And the Confirmed the Hauntings and shadows of the unknown with their latest equipments. Before Going through the Blog You can take a look of the Video inserted to save your time. Kuldhara story is one of the weirdest and inspiring stories I’ve ever heard. About 15 Km. 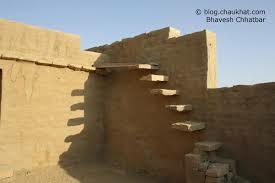 west of Jaisalmer a city in western Rajasthan lies the ruins of a village which was called Kuldhara. The first sight of Kuldhara village, more a town actually, sends one imagination running to the time it may have been inhabited. A well planned settlement, the straight and wide streets ran in grids with houses opening into them. All design elements kept both aesthetics and utility in mind. A kind of a garage opened into the streets to park carts in. Temples, step wells and other structures were all signs of sound development over the centuries. 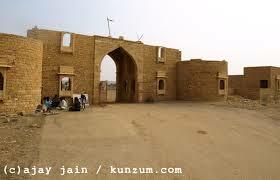 Kuldhara was the name of the largest village in this community consisting of 84 villages. The village was established in 1291 by the Paliwal Brahmins and was a rather prosperous community due to their ability to grow bumper crops in the rather arid desert. Paliwal bhramins were a very prosperous clan and were known for their business acumen and agricultural knowledge. But one night in 1825 all the people in Kuldhara and nearby 83 villages vanished in dark. 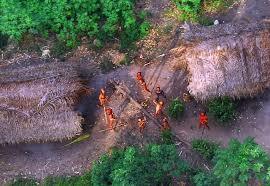 Why did the villagers decide to leave their settlement after having lived there for more that 7 centuries. According to the story, there lived a Diwan of Jaisalmer, Salim Singh, who fell in love with the daughter of the village’s chieftain, as she was extremely beautiful. He wanted to marry the girl and threatened the villagers with heavy taxes if he wasn’t allowed to marry her. Self respect and honor were above all materialistic belongings at that time and to protect these, the chief’s of all the 84 villages decided to leave the place. They took away what they could carry and left behind a curse -that any person who attempted to settle down in the village would die. 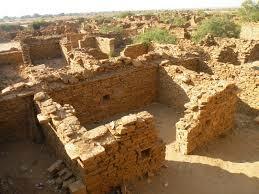 Hence no one dared to live in those villages and so Kuldhara village is also known as the Ghost Village. Nobody knows where they went but it is believed that they settled near Jodhpur another city in western Rajasthan. Though nobody knows exactly how they did it, everybody in all of the 84 villages completely disappeared that very night. Nobody saw them leave or figured out where they went – they simply vanished. It is believed that they cast a curse over the village as they departed that would bring death to anyone who tried to inhabit the land. It is likely that this is the reason why so much of the ancient village still remains (though mostly in rubble, but not stripped for materials). The crumbling brick structures span out towards all directions and a ghostly silence is all that lives on there. There are still some double storeyed houses that are intact and the awestruck tourist can well visualise how life went on in Kuldhara, ages ago. 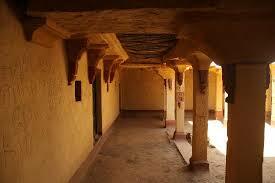 Today the ruins of these villages can still be seen in western Rajasthan and are now tourist sites. The government today maintains the ruins as a heritage site. A walk through the village is akin to wandering onto the sets of a ghost movie. Only, this one is for real. Any one who is planning a visit to Jaisalmer should keep aside a few hours to catch this haunted setting in the eerie desert backdrop. The first look of the village is very haunting and sad with ruins all over. On reaching this village, you will be welcomed by a sand stone gate built just before the village was abandoned. Once in the village Kuldhara, you will feel as if you have stepped into an entirely different world. Wide dusty roads and sand stone houses on either side of roads depict the architectural marvel of the Paliwal Brahmins. Few houses have been restored and these restored houses display courtyards, kitchen, along with other rooms. The Kuldhara village also has temples. Once a prospered village, Kuldhara has now turned into a place full of ruins all over, carrying a curse. Though it is not a very popular tourist place but, travel enthusiasts love to visit Kuldhara. 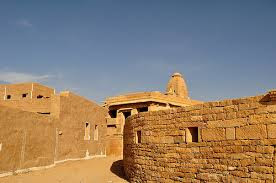 To reach Kuldhara you can hire a taxi from Jaisalmer. North Sentinel Island is one of the Andaman Islands in the Bay of Bengal. It lies to the west of the southern part of South Andaman Island. Most of the island is forested. It is small, located away from the main settlements on Great Andaman, surrounded by coral reefs, and lacks natural harbours. 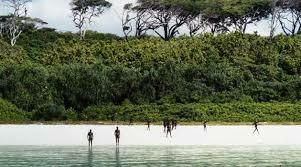 A group of indigenous people, the Sentinelese, live on North Sentinel Island. Their population is estimated to be between 50 and 400 individuals. The Sentinelese reject any contact with other people, and are among the last people to remain virtually untouched by modern civilization. The population faces the potential threats of infectious diseases to which they have no immunity, as well as violence from intruders. The Indian government has thus declared the entire Island, which is approximately the size of Manhattan, and its surrounding waters extending three miles from the island to be an exclusion zone. Sentinelese maintain an essentially hunter-gatherer society subsisting through hunting, fishing, and collecting wild plants. There is no evidence of either agricultural practices or methods of producing fire. 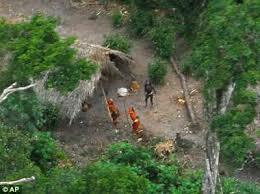 Their language remains unclassified and is not mutually intelligible with the Jarawa language of their nearest neighbors. The Sentinelese are designated as Scheduled Tribe. The Sentinelese and other indigenous Andamanese peoples are frequently described as negritos, a term which has been applied to various widely separated peoples in Southeast Asia, such as the Semang of the Malay Peninsula, the Aeta of the Philippines archipelago, as well as to other peoples in Australia including former populations of Tasmania. The defining characteristics of these "negrito" peoples (who are not a monophyletic group) include a comparatively short stature, dark skin and afro-textured hair. Although no close contacts have been established, author Heinrich Harrer described one man as being 1.6 metres (5 ft 3 in) tall and apparently left-handed. A very little is known about this people as they did not allow anyone near their Island. Their dwellings are either shelter-type huts with no side walls and a floor sometimes laid out with palms and leaves, which provide enough space for a family of three or four and their belongings, or larger communal dwellings which may be some 12 square metres (130 sq ft) and are more elaborately constructed, with raised floors and partitioned family quarters. Advanced metalwork is unknown, as raw materials on the island are extremely rare. It has been observed, however, that they have made adroit use of metal objects which have washed up or been left behind on their shores, having some ability at cold smithing and sharpening iron and incorporating it into weapons and other items. For example, in the late 1980s two international container ships ran aground on the island's external coral reefs; the Sentinelese retrieved several items of iron from the vessels. 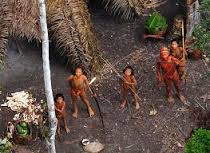 The 1880 British expedition to the island led by Maurice Vidal Portman reported that "their methods of cooking and preparing their food resemble those of the Öngés, not those of the aborigines of the Great Andaman." Their weaponry consists of javelins and a flatbow with high accuracy against human-sized targets up to nearly 10 metres (33 ft). At least three varieties of arrows, apparently for fishing and hunting, and untipped ones for shooting warning shots, have been documented. Fishing arrows have a number of forward-pointing prongs; hunting arrows have ovoid arrowheads, with bodkin-type tips for both purposes, the latter two as well as their associated barbs below the tip made from iron. The arrows are over 1 m (3 ft) long. The harpoon- or javelin-type arrows are nearly half as long again, about the same length as the bows (over 3 m (10 ft)), and can also be thrown or used for stabbing, but the latter probably only rarely. For catching large fish, a harpoon is used which is similar in design to the fishing arrows, but nearly 2.5 m (8 ft) long. 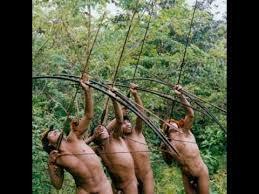 Knives are also known, but it is unclear to what extent the Sentinelese fashion them themselves. Known tools include adzes, pounding and smithing stones, and various finely or coarsely woven baskets for small-grained or larger goods, as well as bamboo and wooden containers. Fires are maintained as embers inside dwellings, possibly assisted by resin torches. There exist fishing nets and basic outrigger canoes used for fishing and collecting shellfish from the lagoon but not for open-sea excursions. Food consists primarily of plants gathered in the forest, coconuts, which are frequently found on the beaches as flotsam, pigs, and, presumably, other wildlife (which apart from sea turtles is limited to some smaller birds and invertebrates). Wild honey is known to be collected and the Sentinelese use a kind of rake to pull down branches to gather fruit or nuts, such as sapodilla and pandanus. This is the last tribe of known Stone Age and if you people are planning to go there to give them a visit, Their usual Welcome comes with a volley of Arrows towards you. They have tried to attack the low altitude aircrafts and Ships in a mean time. I think they hate guests! LOL. In 2006, Sentinelese archers killed two fishermen who were fishing illegally for mud crabs within range of the island. Their boat's improvised anchor failed to prevent it from being carried away by currents while they were asleep. The boat drifted into the shallows of the island, where they were killed. The Sentinelese buried them in shallow graves. An Indian Coast Guard helicopter that was sent to retrieve the bodies was driven off by Sentinelese warriors, who fired a volley of arrows. Looking Forward to get some more from this Calling STONE AGE 2 People.......Meanwhile you can Enjoy this Video Below. Brain as we all know is a very important part of human body. It controls the body and gives us a feeling of being alive. The adult human brain weighs on average about 1.3–1.4 kg (2.9–3.1 lb), or about 2% of total body weight, with a volume of around 1130 cubic centimetres (cm3) in women and 1260 cm3 in men, although there is substantial individual variation. Neurological differences between the sexes have not been shown to correlate in any simple way with IQ or other measures of cognitive performance. The human brain is composed of neurons, glial cells, and blood vessels. The number of neurons, according to array tomography, has been shown to be on average about 86 billion in the adult male human brain with a roughly equal number of non-neuronal cells. Out of these, 16 billion (or 19% of all brain neurons) are located in the cerebral cortex (including subcortical white matter), 69 billion (or 80% of all brain neurons) are in the cerebellum, and fewer than 1% of all brain neurons are located in the rest of the brain. The cerebral hemispheres (the cerebrum) form the largest part of the human brain and are situated above other brain structures. 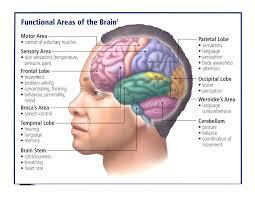 They are covered with a cortical layer (the cerebral cortex) which has a convoluted topography. Underneath the cerebrum lies the brain stem, resembling a stalk on which the cerebrum is attached. At the rear of the brain, beneath the cerebrum and behind the brainstem, is the cerebellum, a structure with a horizontally furrowed surface, the cerebellar cortex, that makes it look different from any other brain area. The same structures are present in other mammals, although they vary considerably in relative size. As a rule, the smaller the cerebrum, the less convoluted the cortex. The cortex of a rat or mouse is almost perfectly smooth. The cortex of a dolphin or whale, on the other hand, is more convoluted than the cortex of a human. The living brain is very soft, having a consistency similar to soft gelatin or soft tofu. Although referred to as grey matter, the live cortex is pinkish-beige in color and slightly off-white in the interior. This is the structure but the main thing we focus is about the powers of brain which are possible. The baby is born with all this powers but as the life goes on we forget everything and so called every power.The Brain or Mind we call consists of two states:-Conscious and Subconscious. Here are a few amazing brain powers. Apportation - Materialization, disappearance or teleportation of an object. Aura reading - Perception of energy fields surrounding people, places and things. Astral projection or mental projection - An out-of-body experience in which an astral body becomes separate from the physical body. Bilocation or multilocation - Being in multiple places at the same time. Clairvoyance or second sight - Perception outside the known human senses. Death-warning - A vision of a living person prior to his or her death. Divination - Gaining insight into a situation, most commonly through a ritual. Dowsing - Ability to locate objects, sometimes using a tool called a dowsing rod. Energy medicine - Healing by channeling a form of energy. Faith healing - Diagnosing or curing diseases using religious devotion. Levitation - Bodily levitation and flying. Mediumship or channeling - Communicating with spirits. Precognition, premonition and precognitive dreams - Perception of events before they happen. Psychokinesis or telekinesis - The ability to manipulate objects by the power of thought. Psychometry or psychoscopy - Obtaining information about a person or object, usually by touching or concentrating on the object or a related object. Pyrokinesis - Manipulation of fire. Retrocognition or post-cognition - Perception of past events. Telepathy - Transfer of thoughts, words or emotions in either direction. This are a few and if you want to unlock the rest 90% of your brain, and be a superhero as as people call it!. You can use the meditation and get to know yourself better. Remember sometimes getting lost is finding yourself. Keep Reading for more such posts. The earliest ancient Egyptians buried their dead in small pits in the desert. The heat and dryness of the sand dehydrated the bodies quickly, creating lifelike and natural 'mummies'. Later, the ancient Egyptians began burying their dead in coffins to protect them from wild animals in the desert. However, they realised that bodies placed in coffins decayed when they were not exposed to the hot, dry sand of the desert. 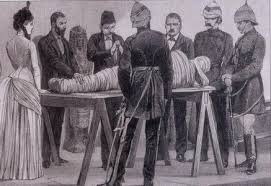 Mummification has been a real Mystery for the whole world, Till date many theories have been regarded for the same. In this blog we will highlight some of the theories. An important man has died and his body needs to be prepared for burial. The process of mummification has two stages. First, the embalming of the body. Then, the wrapping and burial of the body. First, his body is taken to the tent known as 'ibu' or the 'place of purification'. There the embalmers wash his body with good-smelling palm wine and rinse it with water from the Nile. One of the embalmer's men makes a cut in the left side of the body and removes many of the internal organs. It is important to remove these because they are the first part of the body to decompose. The liver, lungs, stomach and intestines are washed and packed in natron which will dry them out. The heart is not taken out of the body because it is the centre of intelligence and feeling and the man will need it in the afterlife. A long hook is used to smash the brain and pull it out through the nose. The body is now covered and stuffed with natron which will dry it out. All of the fluids, and rags from the embalming process will be saved and buried along with the body. The body is now covered and stuffed with natron which will dry it out. All of the fluids, and rags from the embalming process will be saved and buried along with the body. The dehydrated internal organs are wrapped in linen and returned to the body. The body is stuffed with dry materials such as sawdust, leaves and linen so that it looks lifelike. Finally the body is covered again with good-smelling oils. It is now ready to be wrapped in linen. In the past, when the internal organs were removed from a body they were placed in hollow canopic jars. 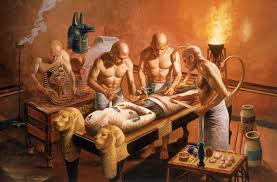 Over many years the embalming practices changed and embalmers began returning internal organs to bodies after the organs had been dried in natron. However, solid wood or stone canopic jars were still buried with the mummy to symbolically protect the internal organs.Each jar has its own properties. Imsety the human-headed god looks after the liver. Hapy the baboon-headed god looks after the lungs. 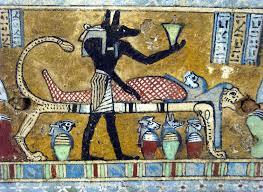 Duamutef the jackal-headed god looks after the stomach.Qebehsenuef the falcon-headed god looks after the intestines. The body has been cleaned, dried and rubbed with good-smelling oils. Now it is ready to be wrapped in linen. This is the main part of mummification. Wrapping the corpse in the linen to complete its procedure of afterlife. First the head and neck are wrapped with strips of fine linen. Then the fingers and the toes are individually wrapped. The arms and legs are wrapped separately. Between the layers of wrapping, the embalmers place amulets to protect the body in its journey through the underworld. The arms and legs are wrapped separately. Between the layers of wrapping, the embalmers place amulets to protect the body in its journey through the underworld.The arms and legs are tied together. A papyrus scroll with spells from the Book of the Dead is placed between the wrapped hands. A cloth is wrapped around the body and a picture of the god Osiris is painted on its surface. Finally, a large cloth is wrapped around the entire mummy. It is attached with strips of linen that run from the top to the bottom of the mummy, and around its middle. A board of painted wood is placed on top of the mummy before the mummy is lowered into its coffin. The first coffin is then put inside a second coffin. The funeral is held for the deceased and his family mourns his death. A ritual called the 'Opening of the Mouth' is performed, allowing the deceased to eat and drink again. Finally, the body and its coffins are placed inside a large stone sarcophagus in the tomb. Furniture, clothing, valuable objects, food and drink are arranged in the tomb for the deceased. Now his body is ready for its journey through the underworld. There his heart will be judged by his good deeds on earth. If his heart is found to be pure he will be sent to live for all eternity in the beautiful 'Field of Reeds'. Imagine You are having the watch which can let you travel through time in Past or in Future any time. You can Go 8 years forward to take your matured Fixed Deposit in Bank. Also You can live your most happy moments again and again . Wow it is So Fun! This Post is about the same keep reading Pal's. Time travel is the concept of movement (often by a human) between different points in time in a manner analogous to moving between different points in space, typically using a hypothetical device known as a time machine. 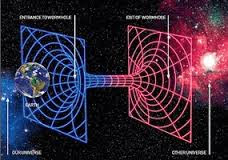 Time travel is a recognized concept in philosophy and fiction, but travel to an arbitrary point in time has a very limited support in theoretical physics, usually only in conjunction with quantum mechanics or Einstein–Rosen bridges. Sometimes the above narrow meaning of time travel is used, sometimes a broader meaning. For example, travel into the future (not the past) via time dilation is a well-proven phenomenon in physics (relativity) and is routinely experienced by astronauts, but only by several milliseconds, as they can verify by checking a precise watch against a clock that remained on Earth. Time dilation by years into the future could be done by taking a round trip during which you move at speeds approaching that of light, but this is not currently technologically feasible for manned vehicles. The concept is popular in science fiction novels; a science fiction novel written in 1895 called The Time Machine, by H. G. Wells, was instrumental in moving the concept of time travel to the forefront of the public imagination, but the earlier short story "The Clock That Went Backward", by Edward Page Mitchell, involves a clock that, by means unspecified, allows three men to travel backward in time. Non-technological forms of time travel had appeared in a number of earlier stories such as Charles Dickens' A Christmas Carol. Historically, the concept dates back to the early mythologies of Hinduism (such as the Mahabharata). More recently, with advancing technology and a greater scientific understanding of the universe, the plausibility of time travel has been explored in greater detail by science fiction writers, philosophers, and physicists. Some theories, most notably special and general relativity, suggest that suitable geometries of spacetime or specific types of motion in space might allow time travel into the past and future if these geometries or motions were possible. In technical papers, physicists generally avoid the commonplace language of "moving" or "traveling" through time ("movement" normally refers only to a change in spatial position as the time coordinate is varied), and instead discuss the possibility of closed time like curves, which are world lines that form closed loops in spacetime, allowing objects to return to their own past. There are known to be solutions to the equations of general relativity that describe space times which contain closed time like curves (such as Gödel spacetime), but the physical plausibility of these solutions is uncertain. Relativity predicts that if one were to move away from the Earth at relativistic velocities and return, more time would have passed on Earth than for the traveler, so in this sense it is accepted that relativity allows "travel into the future" (according to relativity there is no single objective answer to how much time has really passed between the departure and the return, but there is an objective answer to how much proper time has been experienced by both the Earth and the traveler, i.e., how much each has aged; see twin paradox). On the other hand, many in the scientific community believe that backward time travel is highly unlikely. Any theory that would allow time travel would introduce potential problems of causality. The classic example of a problem involving causality is the "grandfather paradox": what if one were to go back in time and kill one's own grandfather before one's father was conceived? But some scientists believe that paradoxes can be avoided, by appealing either to the Novikov self-consistency principle or to the notion of branching parallel universes. An objection that is sometimes raised against the concept of time machines in science fiction is that they ignore the motion of the Earth between the date the time machine departs and the date it returns. The idea that a traveler can go into a machine that sends him or her to 1865 and step out into exactly the same spot on Earth might be said to ignore the issue that Earth is moving through space around the Sun, which is moving in the galaxy, and so on, so that advocates of this argument imagine that "realistically" the time machine should actually reappear in space far away from the Earth's position at that date. However, the theory of relativity rejects the idea of absolute time and space; in relativity there can be no universal truth about the spatial distance between events which occur at different times (such as an event on Earth today and an event on Earth in 1865), and thus no objective truth about which point in space at one time is at the "same position" that the Earth was at another time. In the theory of special relativity, which deals with situations where gravity is negligible, the laws of physics work the same way in every inertial frame of reference and therefore no frame's perspective is physically better than any other frame's, and different frames disagree about whether two events at different times happened at the "same position" or "different positions". In the theory of general relativity, which incorporates the effects of gravity, all coordinate systems are on equal footing because of a feature known as "diffeomorphism invariance". Interested in Such Stuff, Keep Reading For More, To know more about Time travel Write to me. Keep Imaging and mystery Continues. Bhangarh is a village in India that is famous for its historical ruins. 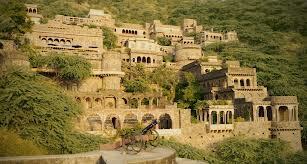 It is in the Rajgarh municipality of the Alwar district in the state of Rajasthan. Bhangarh is at the edge of the Sariska Tiger Reserve but other then that Bhangarh is famous for its hauntings and Ghost stories in whole world. Writing this blog Focused on the history and its stories. First question asked to you people is, "Do you Believe in Ghosts?". If Yes then this place is the paradise for the believers and most important thing prepared for the unexpected. Without any more gossip I will come to the point now. Bhangarh Situated in the Alwar district of Rajasthan, the Bhangarh fort, they say, is not for the faint-hearted people. Rated as the most haunted place in the whole of India this fort demands some nerve on your part to make a visit to this place. A legion of myths and stories hang in the air here, the credibility of which has a double question mark. after it. There is only one way to know the truth of this place and that is by visiting this place in person. The Office of the World heritage is situated 1 km away from the sight which is mostly found near in any of the other heritage. It is not allowed to stay in Bhangarh Fort after Sunset. As it is said that the people who have tried to stay in this place after the sunset doesn't come back again. They are lost under unknown Circumstances. I would like to share one incident with you people about such story. A local film Crew set up a shooting location in Bhangarh for shooting some horror scenes for their movies. They were restricted to stay there after sunset So the crew came back before sunset. But one of the crew members was missing. So Everyone thought that they will go and search the missing person back in Fort After Sunset. They went back to search him and they never came back again. The Question is Where the Whole Film crew of about 30 people can lost in fort without any trace? Isn't this Weird. 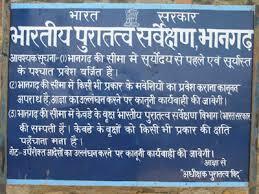 Indian Archeological Survey does not permit any one to enter the bhangarh fort after Sunset. Isn't this scary? This warning does give you a feel (however faint) that something is horribly amiss here and the fact that a number of tourists complain of the air here being heavy with something peculiar leading to a strange feeling in their gut, does not help. However, if you do succeed to keep the negative emotion and thoughts of fear inspired by this place at bay, you will come vis-a-vis with surreal beauty of the Bhangarh fort. Bhangarh-the fabled haunted fort in India must definitely be in your destination list. So come, discover this great monument of mystery. Bhangarh is situated about 86kms from Alwar, the nearest airport being Sanganer airport in Jaipur, at a distance of 56kms from Bhangarh. The nearest station is the Dausa railway station junction, at a distance of just 22kms from Bhangarh. People who have visited the Fort say that the have a feeling of sadness in the Atmosphere of the fort. Some people feel sick there while others say they are followed by bad spirits till there home. If anyone is planning to see this place please share your experiences with us so we can share more of this to others. There are two legends narrated to the history of the fort city which is reported to be haunted and no one is allowed to remain in the precincts of the fort at night as per a notice board put up by the Archaeological Survey of India at the entrance. One version of the legend is that a sadhu named Baba Balanath lived within the fort area. It was his injunction that any houses built in the precincts of the fort should not be taller than his house and in case the shadow of any such house falling on his house would result in destruction of the fort town. In another version, N.K. SINHA, the wizard who was adept in black magic fell in love with Ratnavati, the princess of Bhangarh who was very beautiful and had suitors to marry her from many royal families of the country. One day while the princess, 18 years of age, went shopping with her friends and was buying Ittar (scent). The wizard saw this and replaced the scent with some potion in order to ensnare the princess. He offered the potion to her so that she took a liking for him and marry him. However, the princess saw through the wizard's trickery and when he offered her the bowl of potion, she threw it on a big boulder nearby and as a result the boulder started rolling down towards the wizard and crushed him. Before he died he cursed that Bhangarh would be destroyed soon and no one will be able to live within its precincts. Subsequent to the curse Bhangarh Fort was invaded by the Mughals from the north and the city was surrounded and sacked; 10,000 people lived in the fort city at that time. All the people in the fort including the princess were killed. The present state of the fort is attributed to the curse of the wizard and people believe the ghosts in the fort are that of the princess and the wizard. Since that day, it is believed that paranormal activities take place here during the nights. Some deaths have been reported due to these paranormal activities too. There are sayings that some of the people's spirit surrounds the boundary of the fort as no one can enter the premises. The princess's spirit has been forcefully abducted by the wizard. LOL:- I hope many of you go and invade this theories. May be I can sometime travel there to feel it myself. The beauty hidden in the secrets and mysteries of Spirits and overwhelming pleasures of FEAR.